Resolve HTTP Error 500.19 - Internal Server Error. The requested page cannot be accessed because the related configuration data for the page is invalid. Sometimes we get the below error while trying to browse website. This error comes because asp.net account doesnot appear in IIS. 3. Click on Programs and Features. 4. Click on Turn Windows features on or off. 5. Expand Internet Information Services. 6. Expand World Wide Web Services. 7. Expand Application Development Features node. 8. 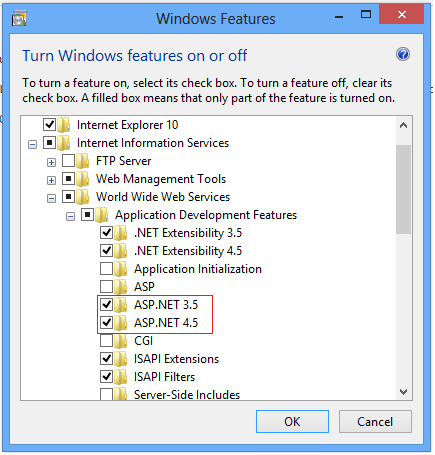 Check the checkboxes related to ASP.Net. 9. Now click OK to complete the step. Now, Browse your website it will start working without any error.